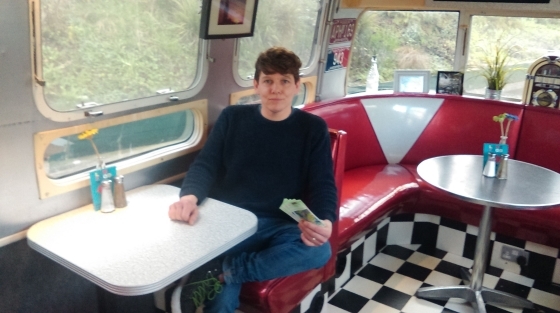 We met up with Charlie from Arnos Vale’s Tube Diner to find out what makes them tick and why they love being a Bristol Pound Cash Point. The Tube Diner is a retro Airstream café based in the vibrant Paintworks creative quarter. They serve up delicious Buttermilk Pancakes, Breakfasts, Burgers, Chilli Dogs and scrumptious daily specials to hungry artists and families. “Being a Bristol Pound Cash Point helps bring in new customers” explains Charlie, the friendly face behind Tube Diner. “It has increased footfall, especially on weekends.” They’re seeing more families and tourists through the door and enjoy the bustle of a busy weekend. Anyone can exchange sterling for paper Bristol Pounds at the Tube Diner on the Bath Road – and Charlie’s a big fan of Bristol’s local currency. The Tube Diner spends Bristol Pounds by buying stock from other local business. They also reward themselves with a well-earned pint at a local bar who accepts them too! Find your nearest Bristol Pound Cash Point. Then head to one of over 850 businesses who accept Bristol Pounds. Loved the food we had at the diner last year, REALLY good dogs, and awesome repport with my two toddlera. However, as with the bar over the road, just a bit disappointed that (especially as a cashpoint (which I think is a more involved/flagship BP retailer)) there is no TXT2PAY option. The simplicity of TXT2PAY is a close second to the localness of the currency, and non TXT2PAY when yheres a TXT2PAY id always seems a bit poor.